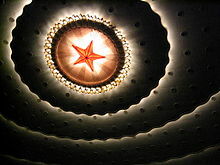 Last night I attended a performance, a concert in the main auditorium of the Great Hall of the People. 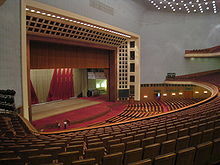 This is the hall where, according to the Chinese teacher who accompanied me, “all the important decisions are made.” Indeed, throughout the concert I was seated at some delegates desk. As you will see from the photo below, this venue is enormous. The concert was given to celebrate the anniversary of the founding of the Chinese Navy, since the time of the Revolution, that is. One of the things that struck me was how muted the applause was. Indeed, at the end of the concert, as all the performers came out to take their final bows, including the composer for the evening, a career naval officer (this was also a retrospective of his work), the applause seemed scattered and, at best, polite. This was because the music, or, more precisely, the lyrics, was described to me as “empty.” In reply I also suggested “nostalgic.” While I could not understand the lyrics, my guess is that the music expressed a desire for a simpler time, when things were more certain, ordered and predictable, “the good old days.” This prompted a brief discussion how China, in the process of development, but doing so at a rate perhaps unprecedented in history, is trying to sort out its heart and soul. What is China? What does it mean to be Chinese? These are questions I asked my students at the beginning of the year. I offered a contrasting example of “Americana” (i.e. possibly cheesy portrayals of the U.S., Las Vegas, baseball, mom and apple pie) and the 4th of July, both of which can create connected feelings of nostalgia, festivity and purpose, but without any deeper understanding for what it means to be “American” (still don’t know what this means myself! ), or the significance of the 4th. In this way each can be at once celebratory and empty. No doubt, the U.S. is also sorting through similar existential questions as China, but with a reasonably dimmer outlook, at least at this particular point in history. Onto other matters below the photos. 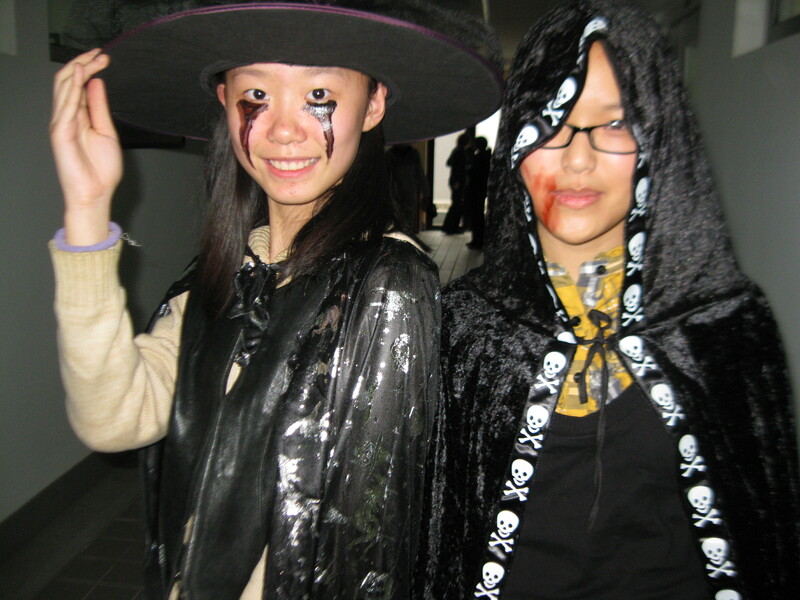 Yes, Halloween came to Beijing No. 2 Middle School after our midterm examinations. The students no doubt enjoyed this, and most all Chinese students enjoy being in front of a camera! 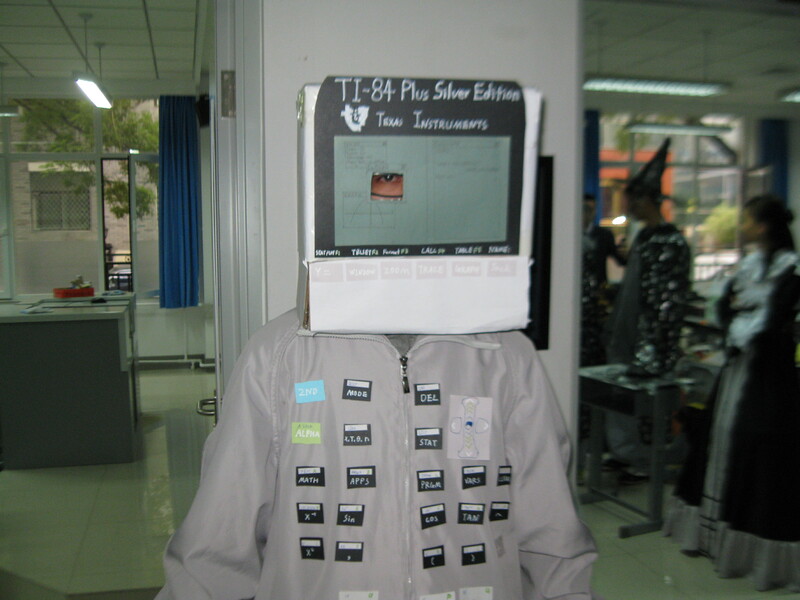 I can take artistic credit for the TI-84 costume, as this was my idea which this student then put into 3 dimensions. 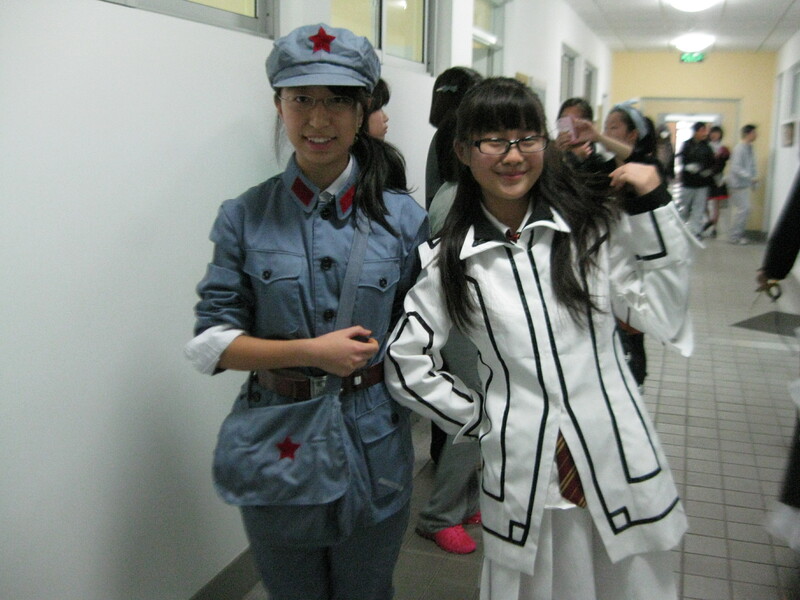 And what is a Chinese Halloween party without a Red Guard! The exams themselves were a first for the students, that is, exams done in English. My exam, which consisted primarily of three short essays, was a true first. This is because most all Chinese students take multiple-choice exams using bubble sheets. This may be due to sheer numbers. One of our assistant teachers attended a boarding school with 24,000 students. Think of it. While some students did exceptionally well, others did not. And, on two separate occasions I had to speak with tearful students, trying as best I could to help them keep things in perspective, and to encourage them to keep going. This is not an easy thing to do in an educational culture where your success on one exam can mean not only the university you go to, but also the trajectory of your entire life. The other day I saw one of our school’s directors walk away from the administration building toward the main academic building with a purposeful stride. A cat, one of two that has taken the school under control, quickly walked after her, and with an equally purposeful stride. I called out to Director Zhou, “You are being followed!” She turned around, laughed and walked back to the administrative building. Sure enough, this cat wanted to be fed, and was not going to let even a school director to go anywhere without first receiving some nourishment. There are priorities, after all. The director in the midst of all this told me that this cat had recently displaced three fish from the school’s little fish pond. This is one serious feline. 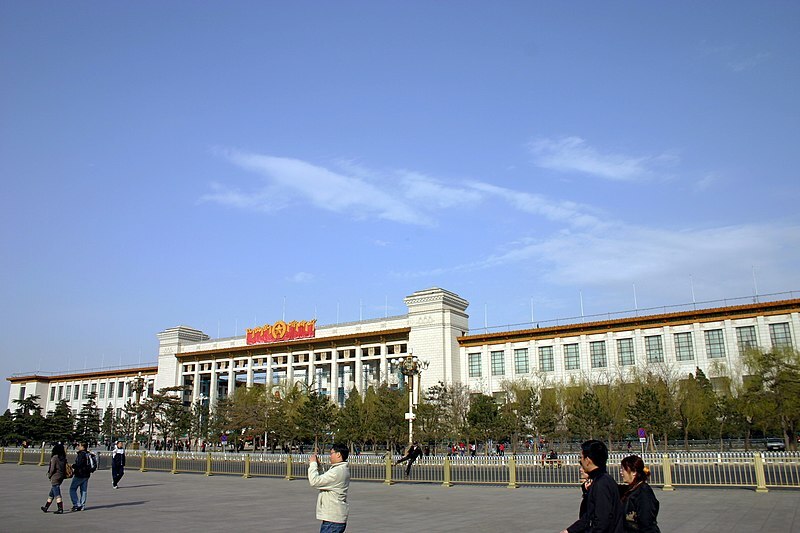 This same director also arranged for me, another international faculty member, as well as several other faculty from the main school, all Party members, to go to the National Museum of China (picture below). It is an amazing place, worthy of several days’ attention and study. In our few hours there we saw modern Chinese history in reverse, going from an entrance hall with an Olympic symbol embedded into this enormous relief sculpture, back to the mid 1850. It occurred to me again that China has undergone the equivalent of the Industrial Revolution, the American Revolution, and the Civil War (not to mention WWII), all in the space of about a century. This kind of historical compression, if not unique in history, is nevertheless rare. Wow, such rich experiences you continue to have! And interesting questions to ponder. Perhaps because America is much younger, it can be a bit easier to hammer out what it means to be American. As someone who didn’t grow up here, I sometimes think it’s easier for me to define, than it is for people who’ve never known anything else. Thank you for your comments, Zoe, and please feel free to pass along my blog site to others! I have a feeling already that the culture shock will be a lot worse returning to the States. By the way, any advertisements you may see here are not mine! I may have to write Word Press about this.